"This is the best finger gelatin recipe. I've been making it for many years. It's simple to make, and kids love it! You can be very creative for parties or events by using cookie cutters to cut the gelatin. Enjoy! Use your favorite flavor of gelatin mix." Dissolve the unflavored gelatin in 2 1/2 cups cold water in a bowl. Combine the fruit-flavored gelatin, sugar, and hot water in a large saucepan; bring to a boil. Stir the unflavored gelatin mixture into the boiling mixture; cook and stir until the gelatin and sugar are completely dissolved, about 5 minutes. Remove the saucepan from heat. Stir 1 cup cold water into the gelatin mixture; pour into a 13x9-inch dish. 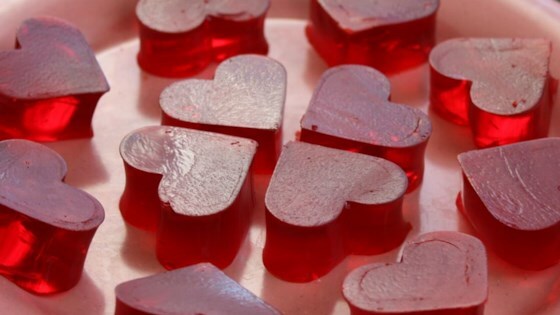 Refrigerate until the gelatin is firm, about 3 hours; cut into squares to serve. Fun and easy Easter dessert treats. This is definitely the best jello recipe I've tried. Kid pleaser for sure! We made this all the time when I was a kid, however the extra sugar is unnecessary though. Works great with sugar free jello also and a nice sweet treat if watching weight. Super simple and super fun. I made a double batch and used the new all-natural Jell-O mix in Mixed Berry flavor. The kiddos enjoyed this jiggly-wiggly snack.